^ I believe they are BAFTA staff. 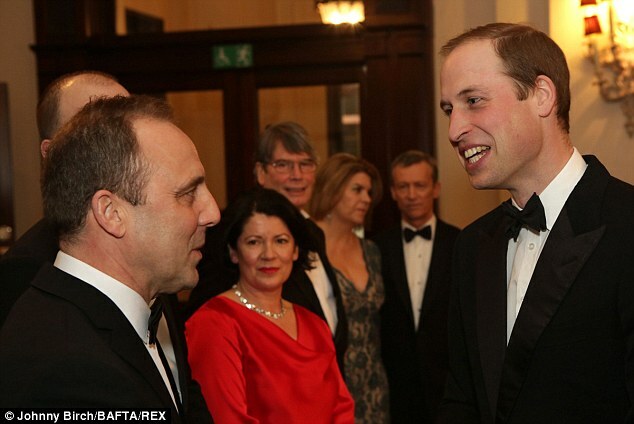 In my opinion, William is out of his depth when he goes to events like these. He's not a celebrity, and it just feels strange when he tries to act like one. It was rather Tom Cruisey I thought. 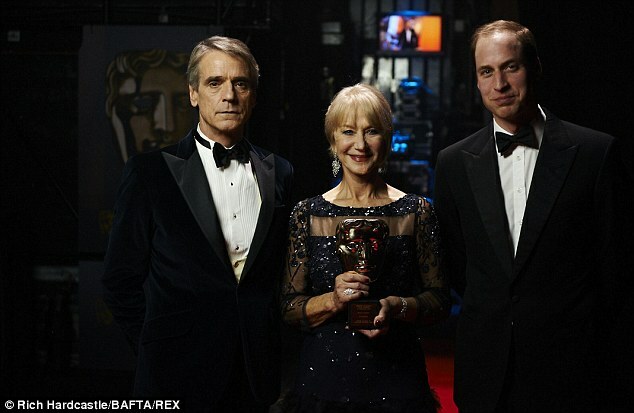 I'm not sure who the bosomy lady was, the other one (on his right) is CEO of Bafta. Miguel Head was sitting in the row behind them with the PPO. 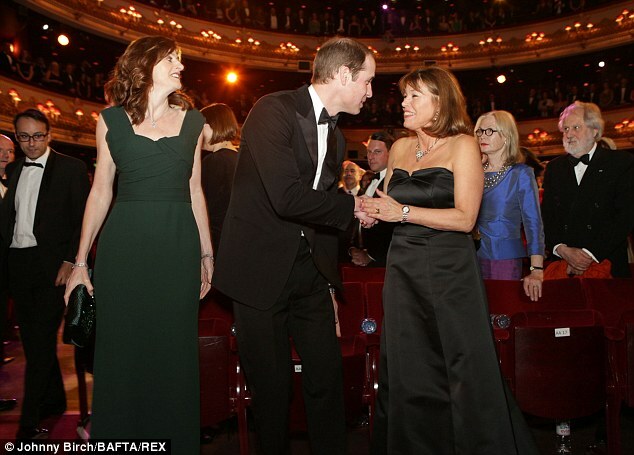 The woman in the green dress is Amanda Berry OBE, Chief Executive of Bafta, I have no idea who the other woman is. 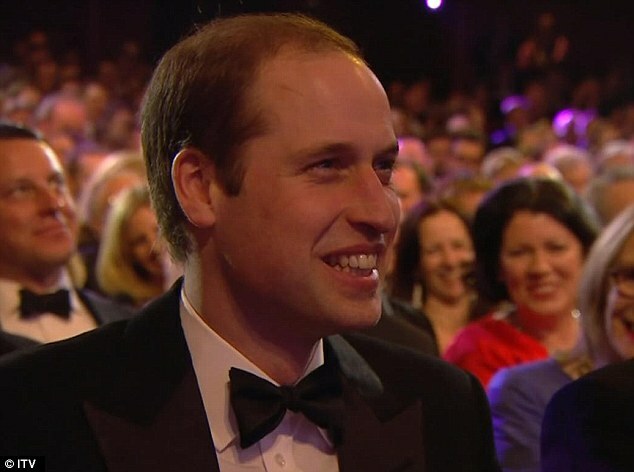 Maybe it's the choice of pictures but Will's hair situation is starting to look better. Maybe he's finally getting the hang of arranging stylish comb overs? 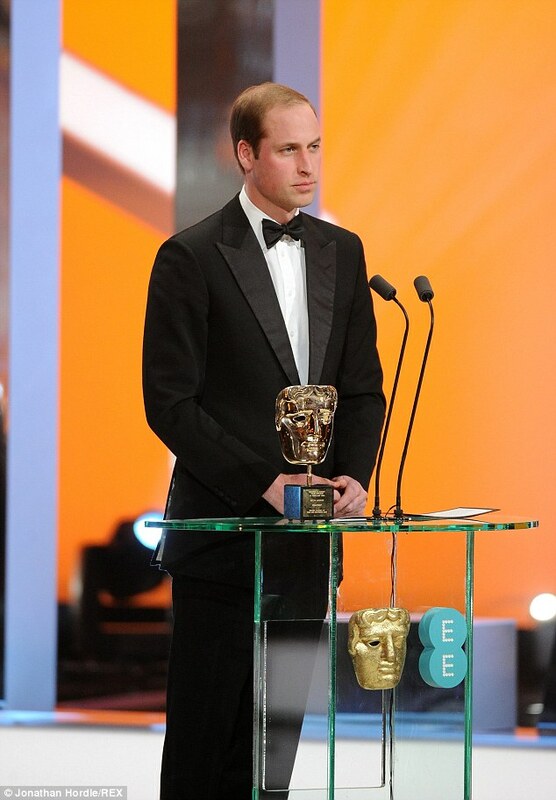 I think William does ok when dealing with the public in his duties. Its the great moments of his life (his engagement, his wedding day, his sons birth) when you feel that every word that comes out of his mouth is patronising & forced (forced happiness). Either he doesnt actually believe what he is saying/making it up, or else he feels happiness and begrudges talking about it. 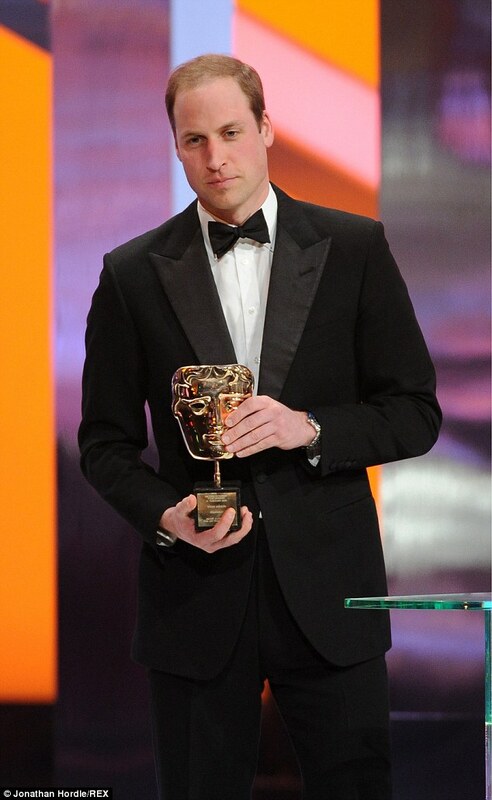 I found him rather fake in the press conference before taking Kate & George home from the hosipital (even Charles was more awestruck and wildly happy when he became a father for the first time back in June 1982). I get what you mean as well. That wedding was just................um..........kind of cold. Going through the motions. I guess that's what Royals do for their weddings? Must be a drag. I don't see much passiona at all from Willy. His marriage, his charities, his wildlife causes.........there just isn't that spark I would have expected from him. For that reason, I like his brother much better, even though he's certainly had a lot of bad PR situations! At least Harry has a SOUL. What is the truth of Wills' relationship with Chuck? Why are they so seldom together? Does Wills ever go to Highgrove or Clarence House? Harry seems closer to his dad. The whole thing is odd. IMO, both are egotistical beyond compare and like things being done their way. Not so much a problem when you have partners prepared to tolerate it and/or figure out how to live with it (Cam still having her own house / Waity being a doormat nursemaid) but perhaps problematic when neither are prepared to back down from their entitlement to attention / being the boss of the world. I reckon they would clash from time to time and, being blessed in position by virtue of magic hoo-has, insisting on their own way. I'd also add they are both from a family of emotionless, rigid, victorian cold fish, who both had in their different ways troubled upbringings. They were both born with entitlement stamped all over them. I think they are as close as these things enable them to be. I certainly think closer than say Charles to his parents Charles is perhaps softening a little under the influence of his wife, the passage of time and maybe a more favourable public opinion of him. I hope that we will not have to wait so long or to have to go through so much sh*t to get Willliam to relax more. When Prince William went on a Spanish shooting trip with his alleged former flame Jecca Craig earlier this month, his wife stayed home at Kensington Palace looking after baby George. Now Kate will have to decide whether to join her husband on an adventure at the unmarried socialite’s estate in Africa. I hear that the Duke of Cambridge is planning to take part in the Safaricom Marathon in June at the Lewa Downs wildlife reserve owned by Jecca’s father, Ian Craig, in the foothills of Mount Kenya. William, 31, is said to have fallen for Jecca, 30, when he stayed at her family’s home during his gap year before he went to St Andrews University (where he met Kate). Jecca sat next to the future king at his 21st birthday party at Windsor Castle, even though he had already become close to Kate. In a TV interview to mark his milestone birthday, he insisted that he did not have a steady girlfriend. In 2008, William failed to attend his cousin Peter Phillips’s wedding at Windsor Castle so he could be at the marriage of Jecca’s brother, Batian, in Kenya. Jecca became engaged to financier Hugh Crossley in 2008, but called off the wedding the following year. The Prince has expressed a desire to take part in the marathon to raise money for the Tusk Trust, of which he is patron. A Kensington Palace spokesman says his participation has not been confirmed. You know how most people today have the attention of a fruit fly and just scan articles? Red highlighted section is phrased in an interesting way because if you don't read the rest of the sentence it appears as though William has just now fallen for Jecca. Following sentences are phrased in a manner to 'support' that statement. Just saying - very clever phrasing.